First, let me tell you about my dad. My dad is a Do-It-Yourself aficionado. He has not bought a single piece of furniture in his entire life and he never misses a chance to proclaim once again his self-sufficiency in terms of furnishing his own house. The truth is he despises furniture stores with passion. In fact, IKEA is more of a swear-word in our family. Why would any decent man buy a ready-made nightstand or a dining table if he can make one with his own hands? Of course, the process may take many months and there is always a possibility that the bulky table of his own production may end up standing in the hallway just because it would not fit through the kitchen door. At the end of the day, this is not about my father being cheap, he just likes to do things with his own hands and he takes pride in his creations no matter how bulky and monstrous they look to other people. Sometimes I meet a similar do-it-yourself kind of people even on the Internet. Why use a free email signature generator if you can open notepad, write code and create an email signature there? There are myriad of tutorials on how to create, for instance, a Gmail email signature template with no HTML knowledge whatsoever, so basically, everyone could cope with this task following the given instructions closely. 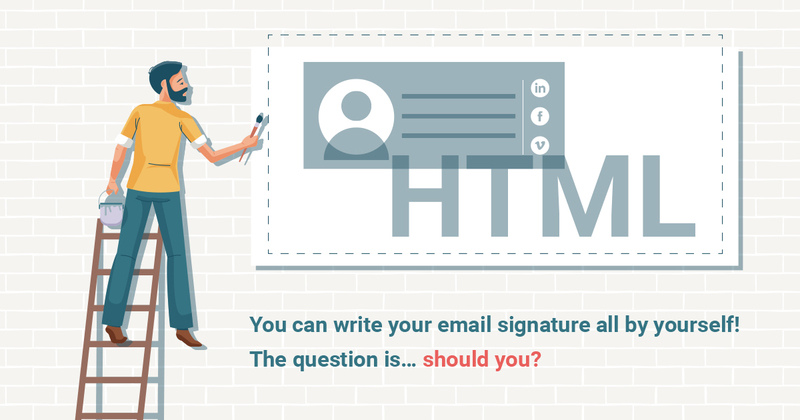 Therefore, it is true, you can write your email signature all by yourself since it is nothing else but lines of HTML. The question is, however, whether it would be a wise decision to do so. Let’s think together. First of all, there is a fat chance that the HTML code you wrote in your notepad will be interpreted and displayed correctly by all email clients. Services like Gmail, Yahoo! Mail, Yandex Mail they all have their own way of interpreting the initial code. Therefore, you will need to take care of multiple adjustments to make even a simple cross-platform email signature. You will have to set up the width and heights of every object, declare margins and paddings so mail clients would not distort your signature. That basically means that in order to avoid such unpleasant things like additional spacing or inadequate gaps between lines on your email signature you’ll have to be extremely attentive when writing code. The slightest mistake could completely ruin your signature. And although some of the tutorials that claim to teach you HTML while creating a free email signature are quite comprehensive they can not cover all the nuances of HTML syntax and if you are not experienced in it you can face serious obstacles while trying to detect that little mistake that ruined everything. 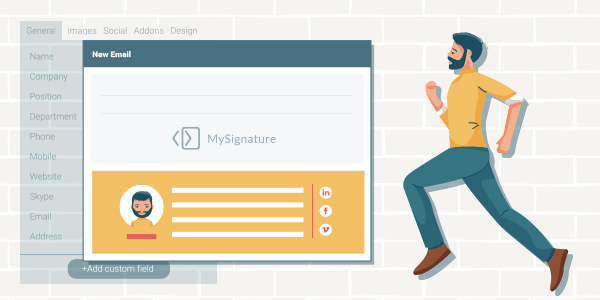 Will your employees cope with their signatures just as well? However, let’s say you are actually good at HTML and you are fine on your own. But if you have a company can you be sure that your employees will cope with their signatures just as well? If your company doesn’t work in IT domain you cannot possibly require them to know HTML coding, can you? Would not it be easier to use some free email signature generator that is both functional and user-friendly? With MySignature, even a kid will cope. Dealing with pictures is yet another huge problem when designing your own email signature without special services. Your photo or the logo of your company is the ultimate visual representation of any business email signature. People will not be willing to work with some obscure partner, they need to see your face or at least your logotype to know who they are dealing with. The bad news is that if the picture used in your email signature is located on some external service it may be considered a threat. Therefore, email services will not display it without asking their users to confirm downloading first. For most users a pop-up notification is suspicious by default and they probably will not be very trusting towards a person whose email letter would trigger a thing like that. Since no email service will care about your reputation, you can cope with this problem only by using specially designed applications that would embed all the images as invisible attachments to your email letter. And that all is just the tip of the iceberg. 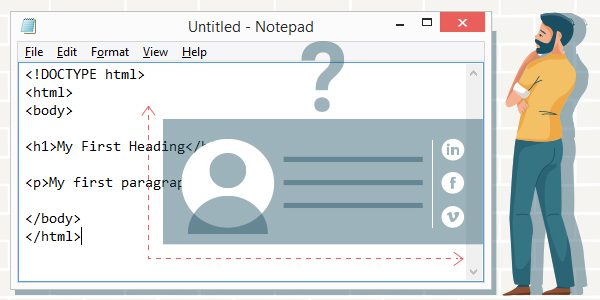 As you can see writing a code of an email signature by your own is absolutely pointless, this task is not worth neither the time nor the effort. If you need a dining table, go to the store and buy one that would not have loose legs and spindles, and if you need to create an email signature just outsource this task to a gmail signature generator like MySignature.